After two nights in Omoa, Honduras, another friend, Emily, was flying into San Pedro Sula from California…we headed there to pick her up.I didn’t have time to type my post in Omoa, the internet cafe was small…and here is a picture of my keyboard. The connection was fast but it gets tricky when the letters are crumbling off as you use the keyboard. 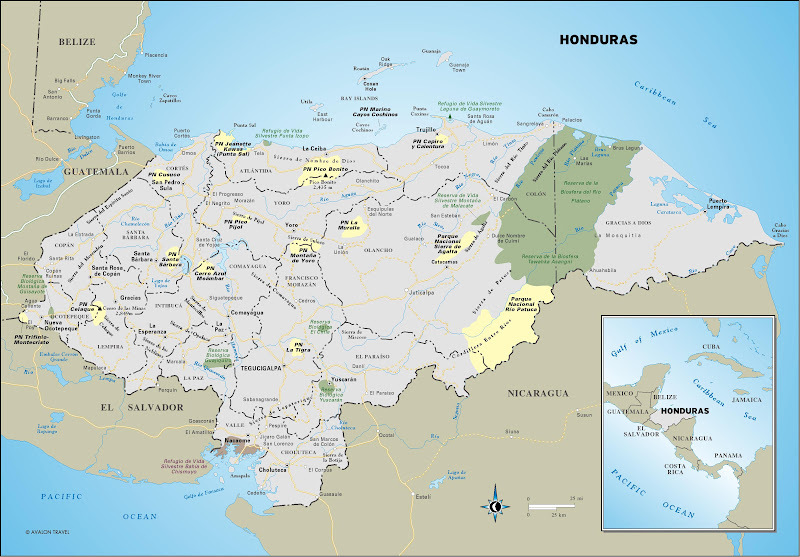 I am now in Roatan, but let’s start in Omoa (there is a map below if you are following us with your playbook). Omoa has an incredibly old but well preserved fort and museum on the way into town. Apparently, this northern Carribean coast was first explored by the Spanish in the early 1500s but it wasn’t a viable town until the 1750s when the fort was built. This whole coast was a hotbed for pirate activity. Particularly the Brits. There is a really nice museum right next door to the fort. The museum is free. $80 lempira (about $4 USD) will get you into the fort. There were rooms, living quarters and storage areas all around the thick walls. It was also surprisingly cool on a seriously HOT day. Interesting fact: the fort was used as a serious (and dreaded) maximum security prison for the first half of the 20th century. The view on top of the walls was gorgeous. Ocean on one side and mountains on the other…but I guess the view is what the fort was built for. There was also a gorgeous mango tree (aka my heart’s fondess wish) right in the center of the green. After the fort and the pick-up at the San Pedro Sula airport, we headed to Tela…it was about an hour and a half drive. We drove into the sleepy Garifuna village of Triunfo del La Cruz set right along the beach. There was not very much going on. Small wooden houses and some crumbling cement buildings, it was set on a very pretty strip of water. We initially found a restaurant (or what appeared to be a restaurant), sat down to have some Barena beers and ask about a good place to camp. There were only 3 people sitting around…honestly, the town seemed deserted. The gentleman (who was clearly well into a bottle of rum) told us he knew about a hotel down the beach that had overnight security…something that is on our “must” list. We packed back into the truck, he grabbed his machete (the accessory of choice for all men in Honduras) and tucked it into his gym shorts. He ran ahead of us (no room in the truck) with the machete swinging precariously over his bare feet. The combination of the rum, machete and tender feet was making me very nervous. We cruised into the Hotel Colon…a restaurant and hotel (apparently the only one in town). There were about 15 Danish college aged students staying there…teaching English to kindergarteners and learning Spanish in return. The beach was pretty but also pretty littered with garbage. These pictures don’t really reflect that but what do you want me to do? Take pictures of trash? The village life was LOW KEY. There weren’t very many cars. Our hotel had wood delivered for the oven the next morning. We woke up relatively early for a swim and to make the drive to La Ceiba, the third biggest city in Honduras. Set between the ocean and the moutains, it’s quite a pretty location. I’m not sure how much time travellers spend in the city itself but it is surrounded by great waterfalls, national parks, hiking, zip lining and white water rafting. We found a cheap but decent hotel ($125 lempiras each for 2 double rooms) in the “night club zone”. A great idea for good restaurants and bars and relative safety but not such a great idea when you are listening to club music at full blast in the middle of the night. I mean BLASTING. Thanks to my roommate, Emily, for the Tylenol PM. We did have a great meal at a place called Mango Tango across the street from our hotel. An outside deck and restaurant under a HUGE mango tree, that dropped delicious mangos constantly on their sheet metal roof. We had to fight a three year old boy for each of the delicious fruits. But you know it is a bad sign when each of the 300+ passengers are giving a barf bag and a paper towel as soon as you are seated. It was all fun and games until…well…you can probably predict what happened next. I’m having fun following your new adventure! Looking forward to seeing some photos from Roatan. It’s on our list of future trips! Definitely should be on the list. The Bay Islands are gorgeous.